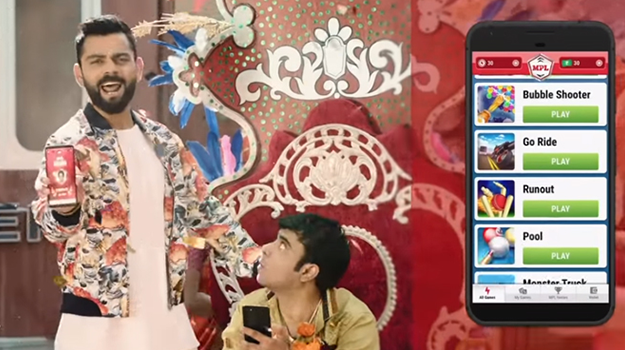 Following the appointment of Lowe Lintas Bangalore as its creative agency, Mobile Premier League has launched its maiden advertising campaign featuring cricketing-star Virat Kohli. The campaign celebrates budding heroes from the streets of India. The campaign idea rests on the insight that for a billion-strong nation there are few national icons who inspire a sense of pride creating unconditional love and acceptance. Sportstars, in particular, attract immense reverence, respect and recognition, primarily because a sport marries nationalist pride, skills of the game, and fame. ‘Ab hargalli se niklega hero’ packs this insight and fills this perceptional void of inspiring sport stars with avid gamers across the country. Commenting on the maiden campaign, Sai Srinivas, CEO, Mobile Premier League said,“We wanted to launch with a bang and ensure our first TVC resonates with our brand and customers, which is why we wanted to keep it young, full of energy, exciting and appealing to Indians across. You will see Virat Kohli in a completely new avatar; shaking a leg with the heroes of Mobile Premier League that resembles a typical Bollywood song and dance celebration. Through this piece of communication, we hope to drive customer interest and build awareness about our brand, inspiring everyone to play MPL and win and become a Hero”. A series of four high-energy anthems rendered in unique local flavours celebrate heroes from across the country. Shot as a typical 70mm movie, with larger than life hero entry sequences, power-packed music to complement the on-screen grandeur, the films are fun to watch. Virat Kohli surprises with spell-binding moves even off the pitch. “Our strategic perspective was that for a country of 1.3 bn, India has very few heroes. Not everybody can become a cricketer or an Olympic medal winner. MPL is a platform that democratises fame and fortune. Our creative idea stemmed from that context- Har Gully Mein Hero. With Virat Kohli’s superb off the pitch performance, we’re hoping that this campaign goes on to create even more success for MPL.”says Hari Krishnan, President, Lowe Lintas. The multi-film campaign is live on and offline.